Prelude: Sideburn is this year’s free incentive figure for members of the Official Transformers Collectors Club. He’s a repaint of Classics Rodimus, so this review will focus on the differences between the figures. Robot Mode: Sideburn pays homage, of course, to the RID character of the same name. Now using the Rodimus mold to make a Sideburn was probably an interesting challenge, given the fact that the RID Sideburn figure was a rather asymmetrical shell-former, while Rodimus is a pretty straight-up hood-as-chest robot. Still, the attempt was made and the result is nothing short of spectacular. Despite being completely different design-wise, RID Sideburn and OTCC Sideburn look very much alike. 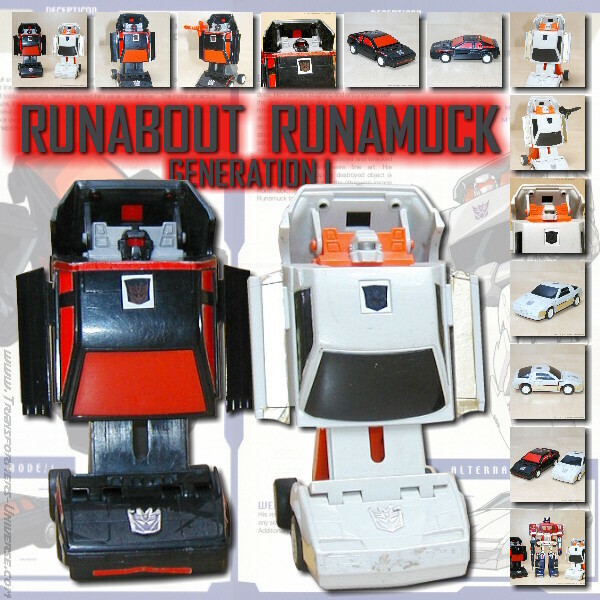 The colour spread is pretty much identical, both have a red-rimmed engine block in the centre of their chest, the colouring on the Rodimus head was selected to match RID Sideburn’s asymmetrical head design (yellow visor over one eye, yellow crest over the other eye), they both carry big missile launchers (that become the exhaust in car mode) as weapons, and they even included the fact that RID Sideburn had his Autobot symbol on his left forearm. Very nicely done, a lot of attention to detail. Apart from the colour changes, Sideburn is every bit the superb robot that Classics Rodimus was (and compatible with the Protector Armour, too, of course). A lot of recipients of this figure complained about quality issues, but me, I can’t complain at all. So the bottom line: a great new paint job on an already great robot. No complaints at all and both thumbs up. Alternate Mode: The original Sideburn became a Dodge Viper, while Classics Rodimus transforms into the same kind of futuristic sports car we saw in the 1986 Transformers Movie. Still, while the cars look little alike in form, the new paint job matches them up superbly. Just about the only difference worth mentioning is the lack of a spoiler on RID Sideburn, but other than that the paint jobs are near-identical, down to the yellow-tinted windows and silver rims. Other than that, nothing has changed. Still a very good-looking car mode with a rather superfluous but functional “attack mode”. Nicely done, no complaints at all. Remarks: Some repaints just seem natural. RID Sideburn was basically the Hot Rod of the RID series, so repainting a Hot Rod / Rodimus figure into Sideburn wasn’t that far of a stretch. This guy here is actually supposed to be G1 Sideburn, though, a new character introduced by way of the Transformers Club Magazin comic strips. He was present during the early days of the Autobot – Decepticon war and actually stood next to Optimus Prime when the Autobot military was first formed. Looking back at the review I wrote for Classics Rodimus in 2006, I gave the figure a straight A. Okay, five years have passed, and by today’s standards the figure could be a tad more posable, but other than that? Nothing has changed. A brilliant new paintjob for a great figure, so I really don’t see any reason to change my original assessment. Recommended to just about everyone.